Cairns is a modern, safe & friendly tropical city with a relaxed atmosphere. Located on the shores of the Great Barrier Reef in Tropical North Queensland, approximately 160,000 residents call Cairns home. The city has a vibrant tourism industry that attracts more than 2.4m visitors annually. Cairns is famous for its close proximity to UNESCO World Heritage icons the Great Barrier Reef and the Wet Tropics rainforests which border the city. To the west are the savannah lands of the Australian Outback and to the north lies the Daintree Rainforest, the world’s oldest living rainforest. These world-class tourism attractions are all easily accessible from Cairns. Experience the exciting Cairns waterfront with the Cairns Esplanade Lagoon, a free lagoon-style swimming pool surrounded by landscaped parklands on the Cairns waterfront. Free BBQ’s and picnic tables are available – it’s a popular spot for casual gatherings for friends and families. The Esplanade is also a popular spot for free fitness activities with jogging and cycle paths, gym equipment, rock climbing wall, volleyball and Petanque areas. Cairns Regional Council runs an Active Living Free Fitness program with different activities, such as yoga, Zumba, Aquaerobics, fitboxing scheduled each day. Cairns Parkrun, a free 5km timed run, is held every Saturday morning and visitors are always welcome to run or walk the scenic course through the Esplanade gardens. Nearby the Cairns Marlin Marina and Reef Fleet Terminal are the departure points for cruise boats heading to the Great Barrier Reef and islands. The Cairns waterfront strip is lined with an entertainment and shopping precinct with modern air-conditioned shopping outlets, bars, nightclubs, restaurants and cafes overlooking Trinity Inlet. The facilities of this small but lively and sophisticated city are world class. Cairns offers a high standard and wide range of accommodation options to suit all budgets; international restaurants; boutique shopping; art galleries; botanical gardens; convention centre and two university campuses Theatres, cinemas, a casino and bars are among its lively range of evening entertainment venues. Famous for sunshine and a warm tropical climate, Cairns is a multicultural society with residents and visitors hailing from diverse cultures and nationalities. The cosmopolitan feel to this international travel destination is enhanced by 2.4m visitors each year who are attracted to Cairns as a modern, clean and friendly city with world-class facilities and tourist attractions. In February each year the Chinese community schedule scores of events to celebrate Cairns Chinese New Year Festival. Celebrations range from Tai Chi master classes, art exhibitions, fortune telling, culminating in a street parade and fireworks to welcome in the new year. Cairns Festival is a week-long celebration of everything Cairns with activities, exhibitions, street festivals and parades for young and old. The Grand Parade and Festival of Lights are two highlights of the festival when streets are closed and the parade route is lined with enthusiastic supporters. The Cairns Amateurs Racing Carnival is three days of fun, fashion, glamour, food and entertainment built around two days of horse racing in Cairns in early September each year. It’s all about horse racing, socialising, fashion and fun with a laid back tropical vibe. With a very low crime rate Cairns is considered one of the safest cities in Australia. However should you require help, call 000 (triple zero) – Fire, Ambulance and Police. For routine matters call 07 4030 7000. Cairns police station is on Sheridan Street, there is also a smaller Cairns police station on The Esplanade. 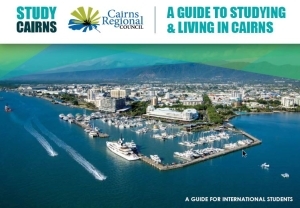 Download A Guide to Studying & Living in Cairns.